The number of small / medium businesses who are considering to embrace the cloud is growing fast, as most of them are keen to enjoy the benefits of such a business decision. 1. Are you looking to cut costs? 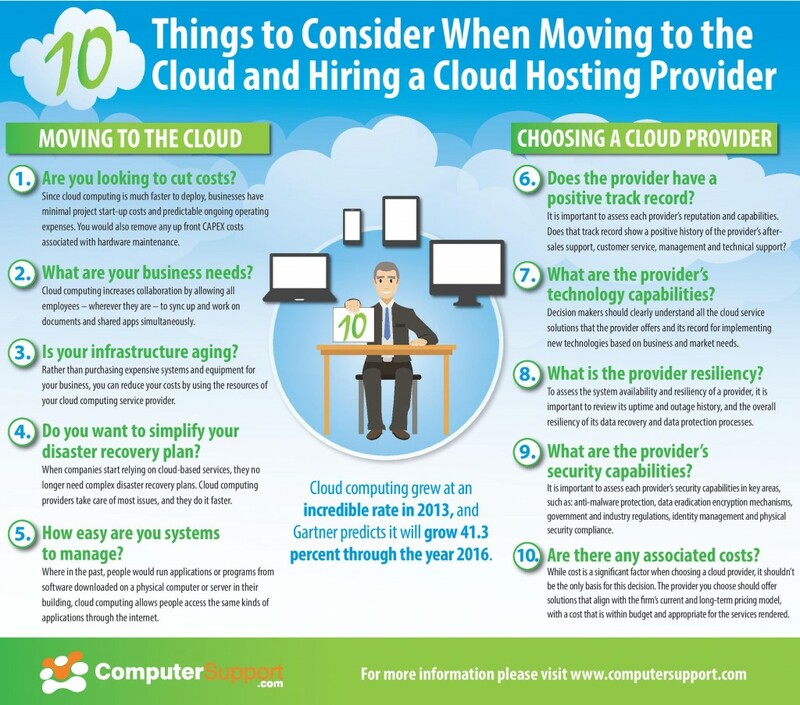 A move to the cloud can be done with minimal start-up costs and predictable ongoing operating expenses. 2. What are your business needs? In an organization of any size, cloud solutions provide a benefit by allowing team members to collaborate on projects using any device, as well as working on files simultaneously. 3. Is your infrastructure aging? As an organization’s technology ages, using a cloud provider allows it to save money on equipment and software replacement. 4. Do you want to simplify your disaster recovery plan? A regularly updated disaster recovery plan is essential for any business. A cloud provider can take over some of the responsibility, using skilled, experienced technologists to keep an organization’s data safe. 5. How easy are your systems to manage? Instead of requiring installations on individual devices, cloud services put data on the web, where it can be used without installation. 6. Does the provider have a positive track record? Careful research can reveal a provider’s reputation in the industry. Pay particular attention to the company’s after-sales support, customer service, management, and technical support. 7. What are the provider’s technology capabilities? A business that will be relying on a technology provider should be fully aware of the solutions that provider offers. What is the provider’s record for keeping up with market demands and business needs? 8. What is the provider resiliency? A provider’s uptime and outage history is essential, as is any availability guarantees. A provider should be willing to put these promises in writing as a Service-Level Agreement (SLA). 9. What are the provider’s security capabilities? Security is essential. Check the provider’s capabilities in protecting your organization against malware, as well as any encryption mechanisms, industry and governmental compliance, identity management, and data center security. 10. Are there any associated costs? Before seeking a cloud provider, determine your technology budget and seek a provider that offers solutions that align with your pricing goals, both long- and short-term.